Brexit risks plunging the Highland hospitality sector into “complete meltdown”, an industry leader has claimed. Colin Watt, who runs Carrbridge Hotel in Cairngorm National Park, has told the Press and Journal that he has been forced to pause a £750,000 investment plan due to Brexit uncertainty. Mr Watt also revealed that he has had to sustain “nightmare” food cost rises of 10-15% as a result of the UK’s exit. He also spoke of his fears for the future of his workforce – 50% of whom are EU nationals. Inverness MP Drew Hendry, who is the SNP’s business spokesman, said the experience of Mr Watt provided further evidence that there was “no good version of Brexit for the Highlands”. Mr Watt said: “It’s a shambles, business and the UK electorate have been sold down the river. “The hospitality sector and service sector in general will go into meltdown if this continues much longer. “I have seen food costs increase between 10 and 15% so far in the last year, suppliers say it is because of Brexit. It’s an absolute nightmare. Mr Watt went on to talk about the human cost of Brexit, he said: “A lot of my staff are scared, they’ve taken a mortgage out, they’ve been working here for more than 10 years, then they get asked to apply for this license to stay. Folk are disgusted by it. UK wide figures published last week revealed business activity had stalled in March and the services sector, which contributes about four-fifths of GDP, contracted as consumers and clients put spending decisions on hold in response to uncertainty. Mr Hendry said the hospitality sector was left “dealing with the fall out of a situation Scotland did not vote for”. He said: “Tourism accounts for one fifth of the Highland economy, and as we approach another summer season, hospitality businesses across the region face staffing shortages, as they struggle to recruit EU staff, who now see the UK as a bad choice for work. “The Tory Government’s treatment of EU citizens throughout this entire process has been an utter disgrace. Here in Scotland we do not just want our EU friends, neighbours and colleagues to stay, we also need them. 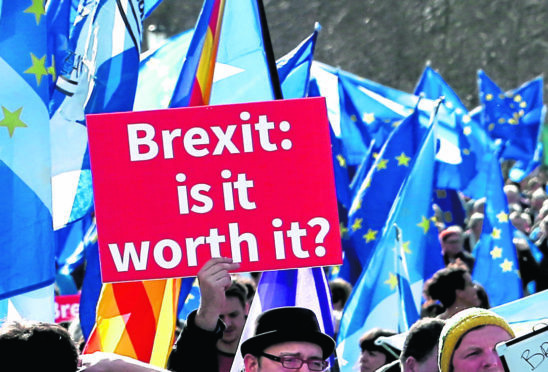 Caithness, Sutherland and Easter Ross Lib Dem MP Jamie Stone added: “Too many of my constituents who are EU nationals are deeply anxious about their right to stay. Many of them fill vital roles in the health service, food processing and the tourism sector. The Home Office said the government is committed to protecting the rights of EU citizens in the UK, regardless of whether a Brexit deal is agreed. However, MPs and peers on the human rights committee last month warned that the Immigration and Social Security Co-ordination (EU Withdrawal) Bill, which seeks to guarantee rights, could leave people in “limbo”. Andrew Martin, vice chairman of the Aberdeen City and Shire Hotels Association, said it was difficult to gauge the impact on the north-east because of its “micro-economy”. He said: “We are very aware of the negative message that is being sent out by Brexit, it’s not a positive or welcoming message to tourists. A UK Government spokesperson said: “The UK Government is focused on delivering a deal that will protect UK jobs and prosperity and provide certainty for businesses as we leave the EU. Our Ministers and officials regularly speak with businesses and their representatives and have published extensive information to help them prepare.